I thought we'd finish off baby shower week with the favors. I don't like guests to leave a party empty handed - especially not a party where they're expected to bring gifts! For the baby shower favors I made apple cider caramels using a recipe found on Etsy's "How-Tuesday" by Heather of Sprinkle Bakes. I doubled the recipe to make enough caramels to fill 25 favor bags. These caramels are great as favors because they can be made a few days in advance. 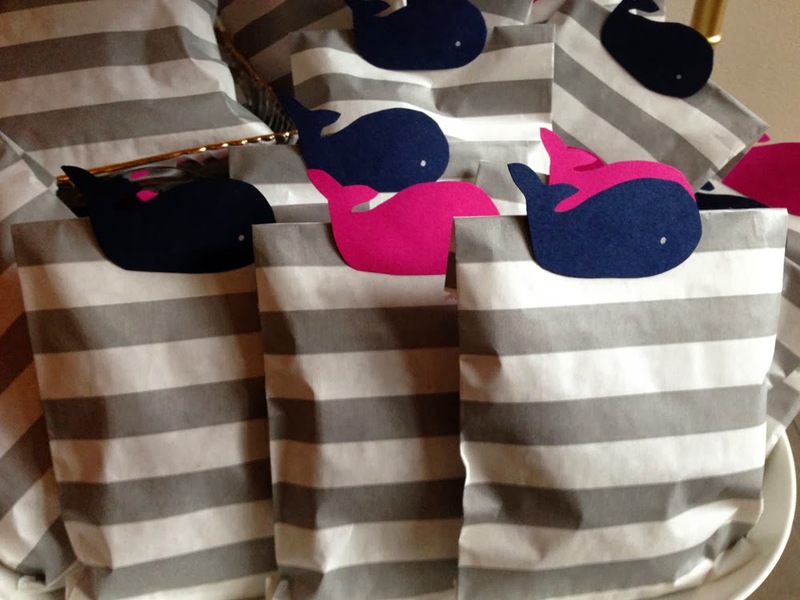 To fit the nautical theme, I chose gray stripes for the bags topped with alternating fuchsia and navy whales. I bought the bags at Paper Presentation. 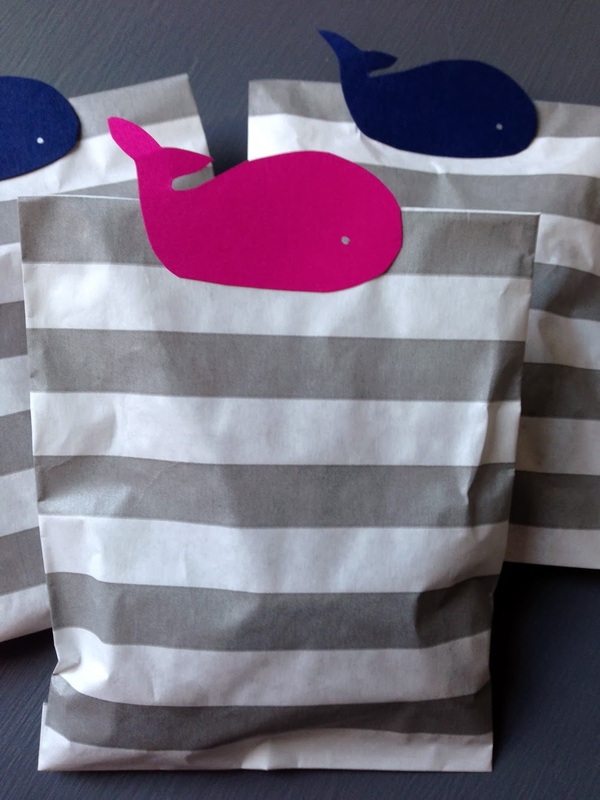 For the whales, I used the envelope liner that Carissa designed. I enlarged the print in Photoshop and printed a single whale to trace onto card stock as a stencil. This wasn't exactly a quick project, but I couldn't find a whale stencil anywhere! For the eyes I used a silver metallic Sharpie. During the party we presented the favors on the bottom shelf of my bar cart. They were a great addition to the decor and really helped get the theme across. Then towards the end of the event we moved them to a table near the exit so guests could grab one on their way out. 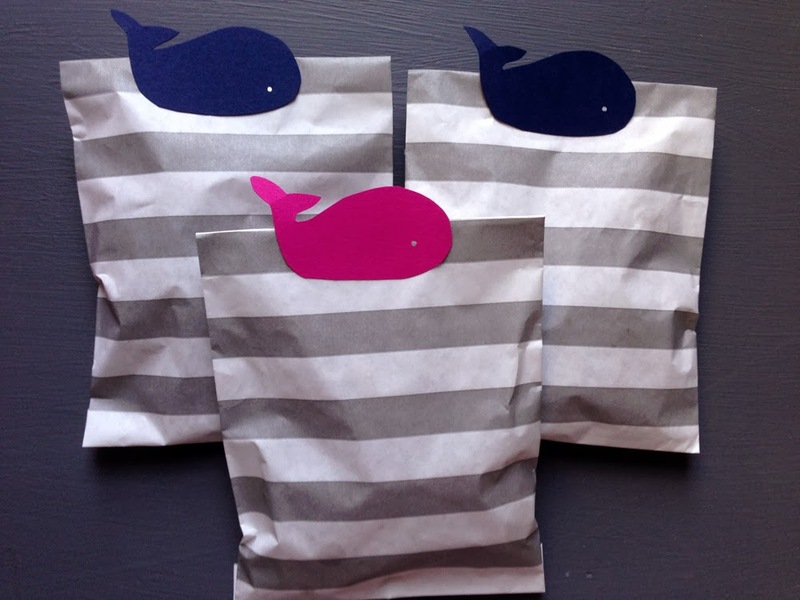 The whales are cut from card stock in fuchsia and midnight from Paper Source.